How and Why I Turned Vegan. For today’s post, I wanted to talk about how and why I turned vegan. I say vegan, I prefer to say plant-based but I am slowly getting there with changing my beauty products and household products for example so now I feel more at ease with calling myself a vegan. I have a whole post on how I became a vegetarian so if you haven’t read that, this might make more sense afterwards. So what happened after Veganuary? When did I first think about veganism or a plant-based diet? If you’ve read my vegetarian story, you’ll know when I started experimenting with vegetarianism but the vegan lifestyle never once entered my head at that point. I had heard of it, but I didn’t know a lot about it and because I was changing my diet for only a month, I didn’t do any further research on it. The first time that I truly thought about not only the diet but this way of living was towards the beginning of last year (2016) My ex-boyfriend went vegan while we were still together at Easter in the same year but he had been talking about it for a few months. So when he did change to a vegan diet, it was really the first time I seen how it wasn’t as inconvenient as I first thought. Bearing in mind that he wasn’t gluten free and didn’t have intolerances, he seemed to cope very well with the diet changes. When we cooked together, we stuck to a vegan diet and mainly used recipes from my Deliciously Ella books because they were easy and weren’t filled with a million ingredients. When we went out I still had my regular cheese on my pizza while he either had a vegan cheese or if that wasn’t an option, he done without. His family raised chickens so I would always take some eggs home with me but the latter months of our relationship, I stopped eating so many eggs. Not for any particular reasons but the thought of eating eggs just made me feel a little more sick. I ate them from time to time but not as much as I used to. I was still having cow’s milk in my tea but I was drinking green tea more often than a regular breakfast tea. Once that relationship ended and I moved back home, it took some time adjusting to being on my own again and cooking for one, but one of my most comforting past times was to cook despite feeling sad that I wasn’t sharing that experience with someone else. I experimented with new recipes; I tried nut milks in my breakfast tea and while nothing quite tasted the same as cow’s milk, I was slowly veering away from regular tea and drinking more green tea. At this stage, I definitely thought about the possibility of changing to a plant based diet but I didn’t have the complete urge to in that moment. When did I start to make a change? Towards the middle of December once I came back from Rome, I started thinking about what I wanted from the New Year and what I wanted from my life. I wasn’t in a great place mentally and hadn’t been for months; I felt so stuck in one place and had no idea who I was or where I belonged (sounds like a midlife crisis doesn’t it?). I got approved for a house shortly before I left for Rome (This was included in my life update which you can read here) so I used that as my motivation to have another change in my life (as if moving out straight after Christmas wasn’t a big enough change for me, right?). That’s when I decided to take part in Veganuary. If you don’t know what Veganuary is, it’s a challenge to be completely vegan for one month. I thought it would be a good way to test the waters to see if I could do it and to see how I felt about it afterwards. After the month was over, I wrote a blog post about my experience and why I done it (That’s linked up above too.) I had it all planned out; for New Year’s Eve, I had got myself one of my favourite lemon cupcakes and made sure I ate it that night. Once midnight hit, I was vegan and I didn’t turn back. If you haven’t read my blog post about the month itself, I would recommend you do. I talk about accidental slip ups and my overall experience of eating plant based for a month. Apart from Veganuary, what was my motivation? My health was my motivation for this change. I know a lot of people do it for the animals and that’s fantastic for them, and it did enter my mind when I first became vegetarian but it wasn’t a main focus for me. I consider myself a healthy person; I was avidly going to the gym, I was eating a relatively healthy diet but I wasn’t satisfied. I was going through a very transitional and strange time in my life including depressive episodes and anxiety so this all was a component of my dissatisfaction. So it wasn’t just a physical health reason, it was also to try and balance out my mental health too. However, no matter where you are in life, food will always play a huge role so knowing I wanted to add in extra vegetables and fruits into my diet, that helped the transition further. It wasn’t long after when animal welfare came into my mind. It’s hard going through life as a vegan and not think about how animals are being treated; I don’t know how I went through life regardless of what food I was eating and not think about it. I haven’t watched that many documentaries about animal welfare and Veganism so I definitely want to educate myself more over the next year about these topics whether that’s through books or documentaries (If you have any good recommendations, please send them through!). In January, I’ll be one year as a Vegan so I’ll have a post about what I’ve learned along the way so stay tuned for that and of course, I’ll have it linked here when it’s up. Thank you so much for reading today and if you have any blog posts about how you turned vegan, please send them my way, I love reading other people’s journeys. Good morning on a lovely sunny Sunday! I hope you’ve all had a lovely weekend so far! Today in the 60th edition of my Sunday Saves, there’s no theme but I will be talking about a life changing diagnosis, technology that could potentially help period pain and podcasts. I came across Lauren’s blog by complete accident when searching for new blog posts and I’m not one to look at people’s life updates especially if I haven’t read their blog but I clicked on Lauren’s anyway. She recently got diagnosed with Coeliac Disease, the auto immune disease connected with not being able to eat gluten. Obviously having a gluten intolerance, I can relate but only to a certain extent; coeliac disease is a much more serious condition. I just wanted to wish Lauren luck throughout her gluten free journey! When this pops up on your Twitter feed, I think you’d be a fool not to click on it, right? As someone who is in tears every other month due to the pain of my period cramps, I look for an alternative ways to deal with the pain that doesn’t involve pain killers. I’ll leave it up to Sammy to give you her review but it’s a little tens machine that could potentially help lower your pains. I love when people talk about podcasts because I don’t think they’re talked about enough! There are so many out there; health, fitness, self-help, comedies, stories; if you can think of a subject, there’s probably a podcast on it. I’m planning on doing a favourite podcasts post myself but if you go to Lisa’s post, you can find out her favourites. She also tells us why she think they’re great and to be honest, I can’t agree with her more. I listen to them when I clean the house and time flies compared to listening to music, I love them. Thanks for reading today’s post and if you want to catch up on the other fifty nine Sunday Saves, you’ll find them all right here! At the beginning of January, I lay out my New Year’s Resolutions for the year and the first one was to complete Veganuary, which I’m very happy to say that I did! So today’s post is giving an overview of the month and what happened next. If you want to read about my journey to vegetarianism, you’ll find it here and if you want to see a typical “What I Eat In A Day: Veganuary Style” you’ll find that post right here. So what were my thoughts on Veganuary? I really enjoyed it but I didn’t expect not to enjoy it. I only accidentally messed up twice and both times were with food I was given at Christmas; jellybeans and fudge to be exact. I was a little annoyed at myself at the time but reflecting back on it, I tried my best, I didn’t do it on purpose and I was able to move on without thinking “I had ruined everything.” That is a massive step for me. I didn’t have a lot of challenges throughout the month. If I was going to restaurants, I rang in advance if it was somewhere I haven’t been before but I believe throughout January, I mainly stuck to restaurants and cafes I knew I would be okay in. I did slightly miss my cups of tea with milk, it’s a habit I have had for almost twenty years so to be without it, it was definitely different but I quickly got past it. A few family members did ask me “When was I going to eat real food again?” Because fruit and vegetables aren’t real food apparently. Having to defend my point almost everytime I seen them for, I would say, a month and a half got very tiring after a while. When you grow up with the concept of meat, potatoes and two vegetables on your plate for so many years (and I believe this is why a lot of the generation above me still haven’t come to terms with a vegan or plant based diet), depending on who you are; it can take a while to get your head around the fact that when you take away the meat (and the potato for me of course!) then what do you do to substitute that. From that point of view, it’s understandable why some people have a hard time with that. I had zero urge to drink another cup of regular tea, I wanted to stick to my gluten free vegan bread and the cupcakes no longer fell into my basket. I don’t mind not being able to eat most of the cakes in the Free From section and I don’t mind having a green tea instead of a regular tea (I love green tea anyway!). Overall, I’m really happy eating a plant based diet and I’m so glad I’ve finally made the transition. I’ve wanted to do this for a long time now but leaving at home and not having as much cupboard and fridge space for all my food made it difficult so I knew when I moved into my own place, it was the perfect time to start. Did you take part in Veganuary? What did you find the most challenging? I’d love to talk to more people who took part in Veganuary so leave me a comment below or tweet me over at @RetroSnowflake on Twitter or @RetroSnowflake on Instagram. What I Eat In A Day: Veganuary Style. In my New Year’s Resolutions, my first resolution was to complete Veganuary, and I did it! If you’re not sure what Veganuary is, it’s a movement within the Vegan community to encourage you to try eating vegan for the month of January. Of course, if you want to try it in March or August, you totally can too. I became vegetarian in March last year (which you can read about here) and I haven’t touched meat since. If you read my blog post, you’ll read that I was never passionate about eating meat so going vegetarian wasn’t a huge life change for me. The majority of my meals last year were vegan so trying out Veganuary this year wasn’t too difficult for me; I knew what meals I could make myself and I knew what changes I would need to make at certain restaurants if I wanted to make the meal vegan. To tie into this actually, I started Veganuary in my new place so it was nice not having to worry about anyone else’s food. I could cook when I wanted without disturbing anyone else and I think that helped, because when I was at home I always had to be cautious especially when it came to having enough room in the cupboards or the fridge. Seems really silly but it does make an impact when you cook a lot. So my meals are very simple and I tend to have the same thing every weekday for breakfast, lunch and dinner. Other people might get really bored with eating the same thing but I like the routine around it. For breakfast, I have porridge (My favourite is the Gluten Free Quaker Oats) with banana and maple syrup. Very very simple, but it warms me up on the early mornings and it takes less than five minutes to make, what more could you want from a breakfast? I normally use a coconut milk or a rice milk because they tend to have a creamier taste and it goes nicely with porridge. Next up is my mid-morning snack. I only tend to have this when I’m at work because I have my breakfast between 6am-6:30am so when it gets to about 10:30am, I’m pretty hungry again. This contains one apple (Green are my favourite! ), Nature’s Path Gluten Free Granola and Koko Strawberry Yoghurt. Most granolas use honey but thankfully this one doesn’t, so vegan friendly. Just make sure you buy the Pumpkin, Raisin and Almond one (it’s an orange packet) because the Strawberry, Blueberry and Raspberry one uses honey, so be careful. I love the Koko yoghurts because most dairy free yoghurts use soy instead of milk so finding a yoghurt that didn’t use that was so great. I’ve tried the CoYo yoghurt before but I find it very expensive and it’s far too thick for me. Now for lunch, I don’t have a picture but I can promise you, it’s not very visually pleasing but I can show you the packaging of it (The picture below is not mine, here’s the source). 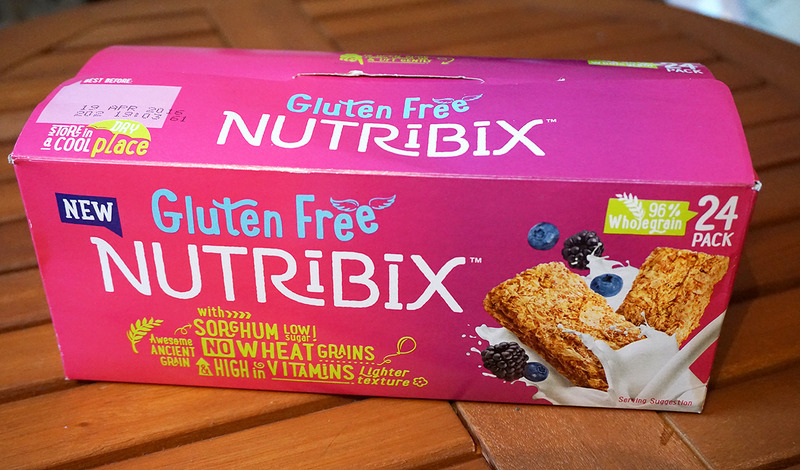 I have three Nutribix and if you don’t know what Nutribix are, they are basically Weetabix without the wheat and gluten. They’re a little smaller than Weetabix so I have three mashed up with coconut milk and a banana. Yes, very boring, but it’s healthy and it ties me over for a few hours. Dinner time is probably my favourite meal of the day and with good reason, it’s so filling and it satisfies me for the rest of the night. It’s my vegan bean chilli that I’ve been making for probably almost a year; I first discovered the recipe last year in my Deliciously Ella book and I have loved it ever since. I’m always changing it up from the original so I’m going to put it up on the blog as my modified version, but it’s delicious! It uses lots of beans, some vegetables, a mix of spices, chopped tomatoes and a healthy helping of rice. I’ve started to add some tortilla chips to it and I normally have a wrap with mine too. In terms of snacks, I try and not snack but there are exceptions. On a Friday or Saturday night I treat myself to a few squares of my favourite chocolate, Ombar. It’s gluten free, vegan and it uses cacao rather than cocoa so it’s perfect for me. Other than that, if I need a snack, I’ll grab some fruit or if I have a Nakd bar in the house, I’ll grab that. I’ve found since moving out that I don’t tend to snack as much but that’s probably more to do with the fact that if I don’t buy it, it’s not in the house. For tea, I drink a lot of green and herbal teas. I’ve been doing that for well over two or three years now so not having a regular cup of tea with milk hasn’t bothered me too much. I used to love a good traditional English Breakfast tea, anyone that knows me knows I was always having a cup of tea. I have tried so many more tea brands (thanks to the Book and a Brew subscription) and because I got a lot of new tea for Christmas, I’ve been exploring new flavours and I haven’t thought about ‘regular’ tea. I have tried to use different milks for English Breakfast but it’s not the same so I don’t even try to make it similar now. Of course, water has always been essential to me, I track it using my FitBit app and I always try and hit that target. I find that during the work week, I can hit it before finishing up at 5pm but the weekend’s are my downfall. I don’t drink any fizzy drinks so water is my only other drink of choice apart from tea. So that was a look at my traditional “What I Eat In A Day”, I did still go out for meals and lunches sometimes but if I wasn’t out, this was what I was eating a lot of the time. My next blog post along the Veganuary lines will be my thoughts on the whole month and what’s next, but if you haven’t caught up on my “Becoming a Vegetarian” post, you should give it a read and I’ll link my “What’s Next” post here when it’s up. I hope you enjoyed a little insight into my eating habits during the month and if you took part in Veganuary, let me know below or over at @RetroSnowflake on Twitter. I have been vegetarian for almost a year and I’ve been meaning to talk about it for quite a while because I’m now a gluten free vegetarian and I know that I personally love reading why people change their eating habits, I find it really fascinating. Back in 2014, I was making a short documentary for college with my best friend Caoimhe (who’s pictured above on the left with me) about being a vegetarian. In terms of research, I decided to go vegetarian for a month; not only to see what food options were out there for vegetarians at the time but it was also to see how people around me, family and friends, would react. I remember jokes being made in class about it, my family didn’t really get it either but it was a good representation of how I thought vegetarians were perceived at that time. Back then, my Mum was still making my dinners when I came back from college so I had her head in a twist because she was making three dinners some nights. In hindsight, the documentary was not what I wanted it to be. It didn’t really have a point and I could write you a list of fifty things I would change about it, but at the time, I was really proud of it. At the beginning of the year last year (2016) I was eating meat; I didn’t eat it a lot but when I did, it was either chicken or mince meat. My boyfriend (at the time) and I started to look at buying turkey mince rather than beef mince because we started looking at how fatty the minces were. He had been eating vegetarian for a few years before we met so he’d told me about meals that he used to make so we started looking at a few cookbooks I had to see about vegetarian alternatives. In finding new recipes, I slowly found myself eating less meat and I was perfectly happy with that. I was never made to feel guilty because I ate meat, it was never something I felt strongly about so when I did start eating meat less, it just made it easier, healthier and cheaper too. In March, there was a movement called “Meatless March”, you might have heard of “Meatless Monday”, this is when you don’t eat meat for a whole day once a week, that day being Monday of course. It might sound silly to some people but it can be the first step for a lot of people to kick start with progressing into a full-time vegetarian diet. I participated in these a lot in 2015, mainly because I was so interested in seeing how it would affect what I ate but then it slowly didn’t even become a ‘thing’ in 2016 because I wasn’t eating meat so often. So ‘Meatless March’ kicked off on 1st March and I never looked back. I have zero interest in eating meat nor do I want to ever again. It was never something I was passionate about as a child or a teenager, so cutting it out completely was pretty easy. As I said before, I didn’t eat it all the time so for someone who was eating it every day, I can see how it could be difficult to find alternatives or know what to cook instead of a chicken or mince in a bolognese for example. I get asked a lot, “Does it annoy you if someone else is eating meat in front of you?” For me personally, it doesn’t and that’s because it’s really none of my business. If someone wants to get a cheeseburger, a ten piece from KFC or even have a chicken salad, who the hell am I to preach to them on what they should eat? Unfortunately there are the selected people who don’t take that approach in life and question me on my eating habits. You get the age old question, “Where do you get your protein?” I’m sorry but why is my protein such a big concern to you? Do you ask anyone this or is it just the people who don’t eat chicken? I don’t mind if it’s a genuine question from someone who’s just interested in knowing more about being vegetarian, I really love that someone is taking an interest in that lifestyle even if they have no interest in participating in it. It’s just those people who use every argument under the sun to dismiss my lifestyle completely, “Oh we were born to eat meat.” We’ll agree to disagree on that one. Eating out can be quite difficult at times, especially if it’s a new place or if it’s somewhere that I haven’t chosen. Being gluten free can be challenging at times but add being vegetarian to that mix and you’re just adding another wooden spoon to the pot. I have my favourite restaurants and cafes that I know I’m safe, so I tend to stick to those which is always handy. I normally try and ring around places I’m likely to go to and see what they have on offer (or if they have a menu online, even better) but if I’m out with friends, I normally ask and if they can’t do me anything, I just mark it on my list of somewhere I don’t go to again. I can’t say yes or no to this because I didn’t have a strong reason at the beginning of when I went full vegetarian, I was gradually becoming vegetarian and “Meatless March” was just the push that I needed. I watched “Vegucated”, “Food Inc. and “Forks over Knives” and to see how the animals were being treated was horrific. I’m the first person to admit I’m not the craziest person about animals; I only fell in love with cats last year and I’m still afraid of dogs, but seeing how the chickens and pigs were being treated and for what? So I could have something extra on my plate? I also watched a film called “Kajaki”, it’s a really good film by the way but in one of the scenes, the main character has to kill a hare (or a wild animal of some sort, I can’t exactly remember) and he sits eating it for his dinner. I felt physically sick watching it, it hit me quite hard. So to answer my original question, it wasn’t just one thing that happened, it was a combination of a few things. Not by meat mind you, it’s more the hidden elements you don’t think about. For a month or two, I was caught out by marshmallows and unless you buy special vegetarian marshmallows, those little squidgy balls contain gelatine, either pork or beef, obviously making them non-vegetarian. It’s a very easy mistake to make, I was annoyed it had happened when it did but I didn’t beat myself up about it. The same goes for little gummy sweets like Haribo, I’m almost certain you can get vegetarian versions of Haribo and there’s even vegetarian versions in Marks and Spencers too, so if you feel like you’re going to miss out on your sweets on a Netflix night, you don’t need to worry too much. Oh, I once went out for pizza and I forgot about Parmesan cheese and after I put it on top of my pizza, my boyfriend asked me did I forget about it. That night I was truly gutted and genuinely annoyed with myself. Well, I took part in Veganuary this past January (that’s one New Year’s Resolution completed!) so I’ll have an entire blog post about that and where I stand on being vegan in the future so once that’s up, it’ll be linked right here and I’ll also be writing about “What I Eat in a Day: Vegan Style” so again, that’ll be linked here too when it’s up. Thank you so much for reading today’s post. I just want to say that this is no way trying to change anyone’s mind about eating meat or not eating meat, I just thought it was important to write about since it’s a big part of my life and I wanted to share a more personal experience. If you have any vegetarian or vegan blog posts like this, please link them below because I love reading them! It’s Blogmas Day Fifteen! So as I explained at the beginning of December, I’ll be blogging until the end of December with Blogmas, rather than just until Christmas Day. Today’s post is 8 Surprisingly Interesting Things 2016 Taught Me and this is Part One of Two. Part Two will be the 8 Life Lessons 2016 Taught Me and that one will be more serious because this year really has been such a massive year, mentally and emotionally for me, and I wanted to address what I really have learned. I was missing out when I chose not to listen to Lady Gaga. For years I refused to listen to Lady Gaga for no actual reason, I have no good plain reason why I wouldn’t listen to her. My friend Leonie then told me how amazing she was (and that I needed to listen to her) and I listened to her latest album, bought it about a week later and now I’m making my way through her back catalogue every morning on my way to work. Leonie gave me my first experience of musicals and I can’t believe I was so against them before (Again, what’s with the pre-judgement?). I had only really seen the hype and annoyance around High School Musical and I just wrote all musicals off because of one film. It was wonderful though; I really respect the actors who can sing, dance AND act in front of a live audience, it’s memorising to watch. Vegan cheesecake is the best cheesecake. Being gluten free, you think that you’ll never have a cheesecake again. Thankfully there’s a plant based cafe in Belfast who make the best vegan, gluten free, refined sugar free cheesecakes and I believe they are quite literally a slice of heaven. Being by yourself gets easier. Date yourself. Treat yourself. Love yourself. Respect yourself. Take yourself out for a cup of tea once a week, give yourself a manicure, let yourself read a book for a few hours, watch a dozen episodes of Friends in one go. Be by yourself and embrace it. 5. There’s nothing better than making your own dinner from scratch. Using Deliciously Ella’s cookbook for the majority of the year, it’s an amazing feeling knowing exactly what has went into your dinner that night, you feel this sense of accomplishment making it yourself and you feel better after it too. Tea with milk really is a British thing. When I went to Italy, they had more black tea or cold tea. I didn’t have a single tea with milk. When people say milk with tea is a British thing, it really is true. They don’t seem to do it a lot in Europe! (In my experience anyway). I prefer being blonde than red (for now). Before my Dad’s wedding, I decided to do something different with my hair and go back to my original brunette but add in blonde too. I used to have blonde highlights when I was younger but it didn’t take me too long to dye my hair back to red then. But now, I really love the blonde and brown, it’s like a new lease of life! Getting up at 5:30am really is incredible. Thank you for keeping up with Blogmas so far! Check back on Wednesday for a brand new Blogmas post.